Shoppers heading into PetSmart will become part of an art project. 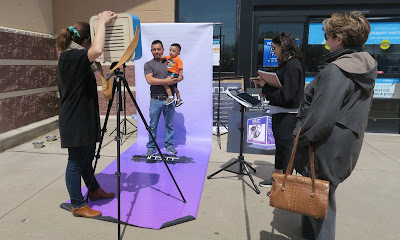 People of all ages shared their opinions about public art and had their pictures taken April 21 in front of the PetSmart in Seven Corners for the temporary INOUT public art project. Those pictures will actually become a part of the eight-foot, solar-powered INOUT Cube, to be unveiled May 12 in front of the Bank of America branch at the corner of Leesburg Pike, Arlington Boulevard, and Sleepy Hollow Road in Seven Corners. The future site of the INOUT Cube. 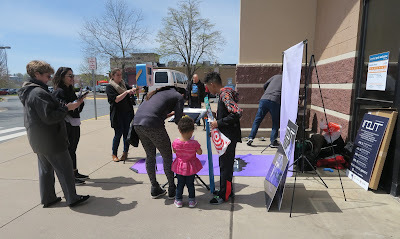 INOUT is part of the Imagine Art Here initiative spearheaded by the Arts Council of Fairfax County. 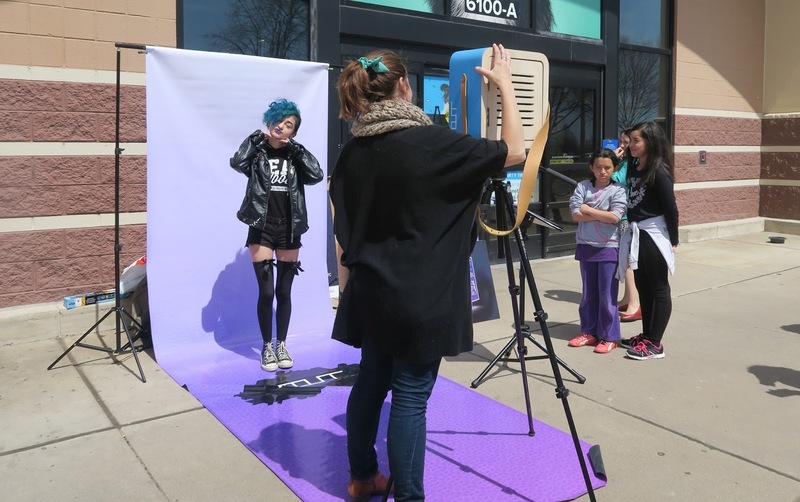 Members of surcreative, the Annandale-based artist team that designed the INOUT project, is hosting photo booths around the community to collect black-and-white portraits of local residents and solicit feedback on their perspectives about public art. INOUT features portraits of the Seven Corners community. Linda Sullivan, president of the Arts Council was at the photo booth, too, encouraging people, many with dogs in tow, to take part in the project. The next opportunity to engage with the INOUT project will be April 26 at the Dar Al-Hijrah Islamic Center, 3159 Row St., Seven Corners. 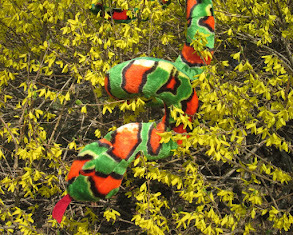 Upcoming photo sessions are scheduled for April 27 at the Dogfish Head Alehouse, 6220 Leesburg Pike in Seven Corners, and April 28 at the All-You-Can-Eat Crab Legs and Shrimp Feast, co-hosted by the Bailey’s Crossroads and Annandale Volunteer Fire Departments, at the Annandale fire station, 7128 Columbia Pike. Community members can also upload their photos to the project via Twitter, @INOUT7C, by using the hashtag #INOUT7C and can fill out the questionnaire online. People take a survey on public art. The INOUT Cube will be up for six weeks, May 12-June 23. During that period, a photo booth will be set up next to it every Saturday evening, 7:30-9:30 p.m., to enable live projections of community members’ portraits onto the Cube. “By seeing people’s pictures, you can really get a sense of what the community looks like,” said Natalia Pires of surcreative. One side of the Cube will display questions from the survey, and members of the public will be able to peel off stickers from the Cube and stick them on the structure’s main face according to their response.